The NAWA Sculpture in Warsaw is not only a striking piece of design, but also the realisation of Oskar Zięta’s vision for the future of industrial design. The self described ‘architect, engineer and designer of forms,’ has developed a new approach to working with steel called ‘FiDU’. The process allows designers and architects to distort the shape of steel elements by “inflating” the steel with compressed air. As a result, the steel structures become durable and stable, and maintain their lightness. The NAWA Sculpture was the first large scale construction to make full use of this innovative technology. “We’re interested in creating new technologies and inventing new applications for the construction industry” says Zięta. 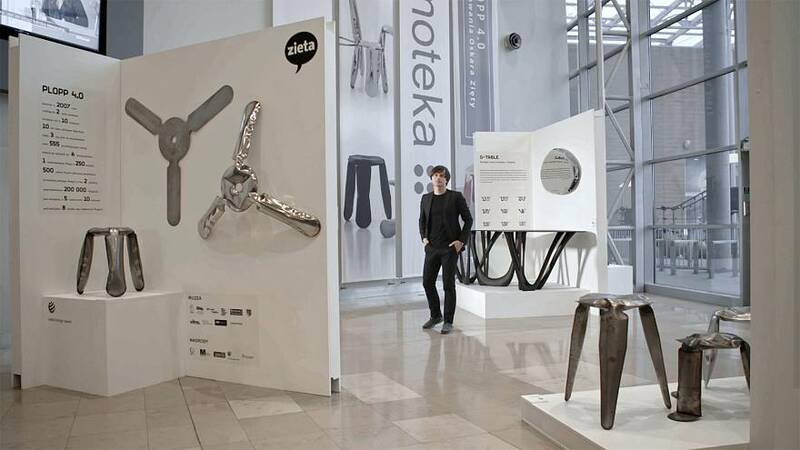 His team at Zieta Prozessdesign continue to refine the process, using the FiDU technology for a wide range of applications, from small scale furniture and industrial design to large architectural structures and sculptures, as well as developing a new technology that can be applied for electric vehicles.